Things have quickly changed for the Bruins. Just a few weeks ago the focus for the black and gold was the top line’s inefficiency and lack of production. Speculation surfaced about Milan Lucic being out of shape and whether or not Nathan Horton even deserved to be with the first unit. 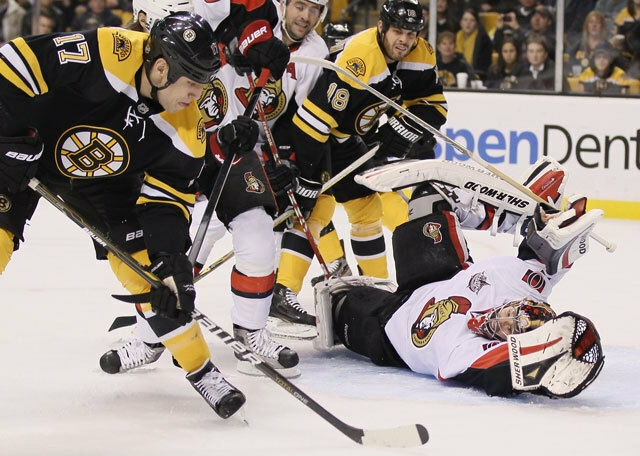 Tuesday night, Horton, Lucic and David Krejci were once again the most significant line, leading the Bruins to a 3-2 win over the Ottawa Senators. Boston went down 1-0 early in the first period as a sloppy turnover led to a simple backhanded goal by Ottawa’s Colin Greening. The B’s bounced back just 40 seconds later when Lucic got the puck to Zdeno Chara, who rocketed a shot, which deflected off Krejci and past Sens’ goaltender Robin Lehner. A minute after the Bruins first goal, they lit the lamp again as Brad Marchand fed a wide open Tyler Seguin through the slot, finding him in front of the net for the 2-1 lead. Outshooting Ottawa, 21-19, and carrying momentum through the first 20 minutes, an uneventful second period quickly turned disastrous for Boston when Greening hit Patrice Bergeron in the head with his elbow. Bergeron immediately skated off the ice and down the tunnel after his shift. During the second intermission the Bruins announced that Bergeron wouldn’t be returning to the game, and no updates of the actual injury were provided. Senators defenseman Andre Benoit scored the equalizer at 1:55 in the third after a review by the officials. Originally the play wasn’t called a goal, but the replay clearly showed the puck crossing the line and bouncing back out. Albeit, Bruins goalie Anton Khudobin, who made a career-high 45 saves, got some support from his teammates to make sure his efforts weren’t wasted. Tied at 2 midway through the third period with the risk of giving up yet another late lead, Lucic sent a shot towards the net which bounced off Lehner. Horton, despite being surrounded by a few defensemen, crashed the net and tipped home his 12th of the season, giving Boston the 3-2 advantage. The goal was Horton’s fourth in four games. Krejci finished with a goal and an assist, recording his sixth multiple point game of the season, while Lucic contributed with a pair of helpers for his third multiple-point game of the year. However, now there are different discussions surrounding the top line. With the newest acquisition of veteran forward Jaromir Jagr, the question is where will he land in the lineup and how will the players be shifted? Only time will tell what role the 41-year-old winger will play. As for any questions about the Lucic-Krejci-Horton line, those are being answered now. And the group is making a pretty solid argument of why they should remain together.